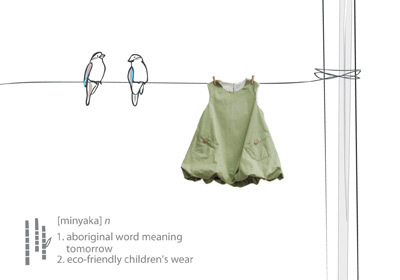 If you love no-fuss, classic lines for kids using organic cotton, hemp and bamboo, then new Australian childrenswear label Minyaka Design is definitely for you. We are university buddies (nope, we’re not sisters) and Minyaka Design is our first collaboration. Jamie has a background in interior architecture and Michelle in fashion design. Although we come from different disciplines, we share the same vision so it works! It was always so difficult to find beautiful, quality gifts for children, so we decided to do something about it. Now one year later and after many all-nighters, we are very excited and proud to finally see the fruits of our hard work with the launch of our first summer collection and the winter one just around the corner! Both of us are passionate about the well-being of children and the environment and this has inspired the way we do things and our decision to use eco-friendly fabrics such as organic cotton, bamboo and hemp. We are also supportive of the local industry. All our products are made in Australia and we source locally where possible. What makes Minyaka Design different? 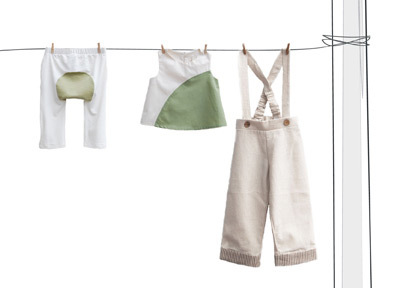 Children’s clothes need to be functional but they can be so much more! All our clothes make us wish we were children again, just so we can wear them! Take our bubble dress for instance, how we wish we had one when we were little! Childhood is so short and precious. So we put a lot of love into all our creations and hope that our beautiful and fun things can add something special to the photo albums and memories of mums, dads and families. We believe the simplest, most natural creations are often the best. We aim for each creation to reflect Mother Nature’s simple, elegant style with our own playful twist. If you could pick an ice-cream flavour for Minyaka Design, what would it be? Vanilla of course! It’s an all time classic favourite. It’s so simple yet it will get along with any toppings…strawberries, chocolate, nuts, sprinkles, you name it!! What is your favourite thing about Minyaka Design? We try to make each of our customer’s experience special. Our products even come packaged in a calico bag personally sewn and screen printed by us! This is just the beginning, there’s a lot more to come!! Thank you Jamie and Michelle. I can't even wait to see what is next from Minyaka Design (the bottom image is a sneak peek from the Winter 2012 collection - YUM!). You can find Minyaka Design in the online store and at various markets (keep an eye on the website for details). And lucky for us, Jamie and Michelle are offering Bondville readers a 10% discount on online sales until the 31st December 2011! Simply enter the code THXBONDVILLE at the checkout. Discount terms: does not apply to items on sale. Only one coupon per customer. One coupon per transaction only. Coupon is not redeemable for cash. For more great Australian-designed clothes for kids, head over to Bondville Kids Style.